Do you remember when I canned tomatoes earlier this summer? To say that I am obsessed with using them is one understatement....to also state that I am in a sheer panic of the day that eventually I will run out and have to make more is another. But the one thing that I will tell you, having these canned jars of awesomeness within reach have really eased my plans when looking for something to make for dinner. As most foodies can attest, most of the time I get bummed when I have a meeting after work so that I am not able to make dinner for the night. But, there are those seldom times where you went balls to the wall all day and the last thing you want to do is stand in a kitchen. Instead of going out and spending money, last week I made a recipe I want to share. 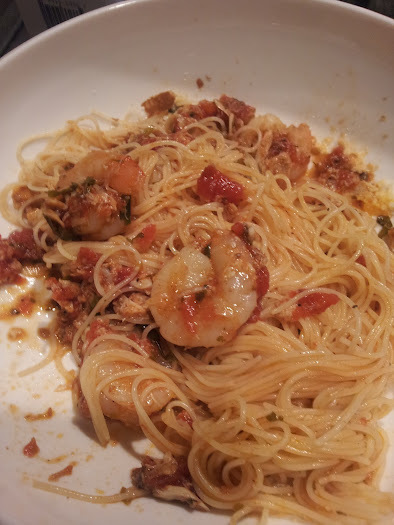 I am featuring shrimp in my recipe, because in search of eating healthy, shrimp is easy to cook with and a choice that even the pickiest eater will feast on.. Known for its sweet taste and versatility, the scrumptious shrimp is the all-occasion fare for every season, and the fall is no exception. As a nutritional bonus, a 3-ounce serving of shrimp contains a mere 83 calories and just 1 gram of fat, while providing nearly 20 grams of protein and a wholesome serving of heart-healthy omega-3s and essential vitamins, such as B12 and selenium. It’s the protein-rich crustacean that fits perfectly on any menu. The Shrimp Council, whose mission is to promote shrimp as a nutritious and delicious protein, is home to a treasure chest of mouthwatering shrimp recipes which can be found here. It makes it real easy when you are busy but still want to eat healthy for dinner tonight. I will be honest, writing recipes is really hard for me. I am Italian so it is always a little bit of this and a little bit of that ...hence, why I am a TERRIBLE AWFUL baker!! This one is so very easy, I shouldn't have a problem. 1 lb of small shrimp, cooked. italian spices, either fresh or dried of your choice-I usually use parsley, rosemary, oregano, basil, Cavenders, salt and pepper, etc. In a medium saucepan simmer onions, garlic, olive oil and butter or margarine for about 5 minutes. Add red wine, sugar, and all spices and simmer for another 3 minutes. Add tomatoes and cook on low as little as 15 minutes or as long as all day! The longer it cooks the better it tastes. 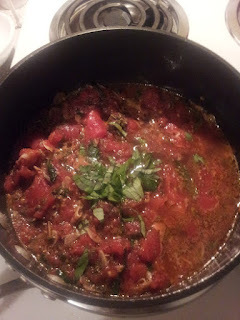 Be sure to stir often and if you see anything on the top that needs to skimmed, that is the acid from the tomatoes. Do your best with a spoon and skim that off. While that is simmering, grab a paper plate (save on dishwashing) and lay out your shrimp. 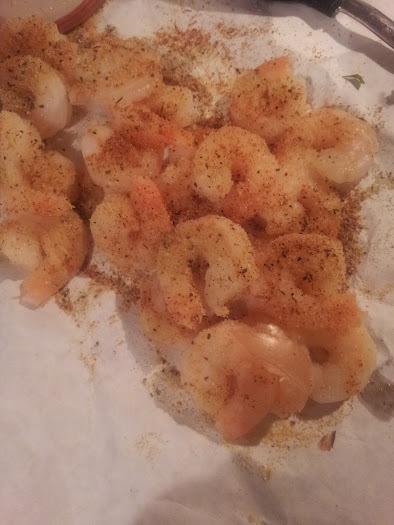 stream a little olive oil on top and then load them up with spices...I usually do salt and pepper, garlic powder, again Cavenders, some Old Bay is you have it Chef Paul Prudhomme's Magic Seasoning, Shrimp. The trick here is to be generous!!! Start your water boiling. I salt, and then throw some oil in the water. When the water starts to boiling, add the spaghetti. Make sure you check the directions and take about a minute away from what they suggest you cook the pasta...you want the pasta to be ala dente. While the pasta is cooking, add the shrimp to the sauce. You want to make sure that the sauce is not cooking at too hot of a temperature so you won't over cook the shrimp. Once the shrimp is warmed up and well mixed into the sauce, add red pepper to your spicy preference. I like to do this at the end so the other spices have a chance to really get into your sauce before the red pepper takes over. Add the pasta to the sauce and shrimp (or visa versa) and mix quickly to blend under no additional heat. Serve a salad and maybe splurge with some garlic bread and voila! The best thing about this dish is it is quick, easy and healthy if you use the right pasta. As far as wine pairing, with its competing spices and acidic tomatoes, this pasta dish calls for a simple Italian white like Pinot Grigio.